Members of the renowned Handel and Haydn Society perform the glorious music of Antonio Vivaldi, including Sinfonia "Il coro delle muse," RV 149, Concerto for Violin in E-flat, Op. 8, No. 5, "La tempesta di mare," Sinfonia in G, RV 146, Concerto for Viola d'amore in D, RV 392, "Ostro picta, armata spina" (Introduzione to Gloria, RV 588), solo motet for soprano & strings in D, RV 642, cantata "Lungi dal vago volto" for soprano, violin, and basso continuo. This concert is presented with Venetian Heritage. The exhibition Invention and Design: Early Italian Drawings at the Morgan will be open at 6:00 pm for concert attendees. 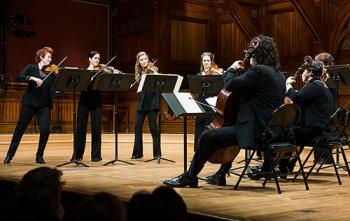 Photo credit: Handel and Haydn Society. Photography by Lara Silberklang.